Can someone tell me if you can use a Clarisonic in the shower?? The idea of bringing anything electronic into the shower slightly disturbs me but I've always been curious to try them out. Anyways, there's a reason for my rambling that totally relates to today's post. Due to my skepticism and fear of bringing a Clarisonic in the shower plus the alarming price tag, I started doing research on a cheaper option that would bring a similar level of deep cleaning and exfoliation to my nighttime skin routine. I love the scrubs I've found but I feel like I've hit a plateau in the level of cleaning they can deliver with me just massaging it in, I wanted a tool that could really get things done. 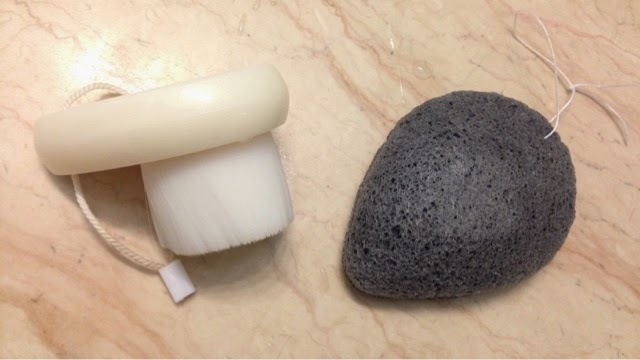 After looking at multiple options, I finally settled on two products to test out and today I'm bringing you a comparison between the konjac sponge and the facial brush! Here's what they look like. I purchased both of these off Amazon (funny story about a week later I got a facial sponge in a Memebox! Wish I knew that was coming...) the specific ones I got was the My Konjac Sponge All Natural Fiber Bamboo Charcoal Facial Sponge and the Dr's K Facial Cleanser Exfoliate Brush-Facial Skin Care Beauty Ultrasoft Pore Cleansing Spa Wash Massage Exfoliation Brush. Oh yes, those names were direct copies from the Amazon site. I used both of these by itself for a month each to really get a sense of how my skin responded to them. Just for reference I have oily acne prone skin and larges pores. I'm always on the hunt for exfoliating magic to help smooth out my skin and flush out those pores. 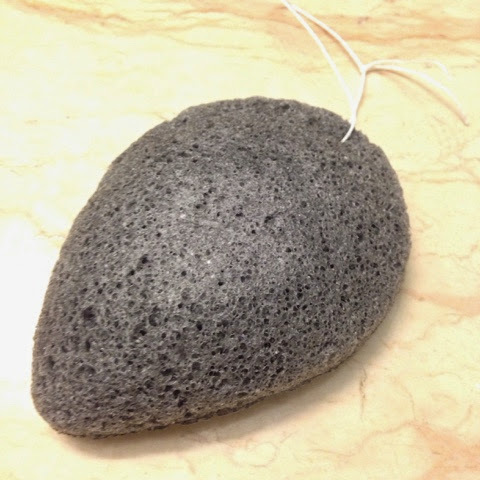 First let's talk about the konjac sponge starting with the most basic question, what it is! It is made from the konjac potato plant and this one is formulated with bamboo charcoal extract because it is targeted towards oily and acne prone skin. 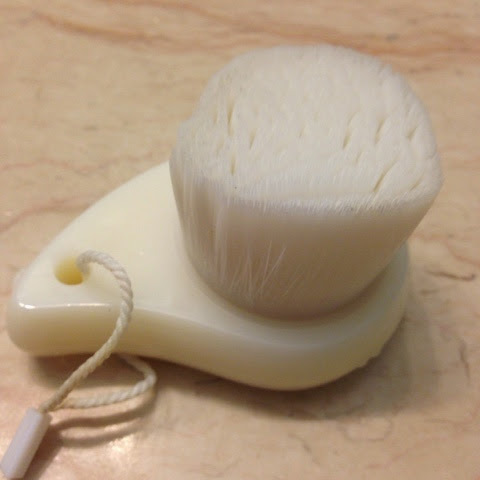 It is a hard sponge that you wet with water to soften the fibers and then you can use it by itself or with a facial cleanser to buff away the dead skin cells. I must say this thing is fantastic! There was a noticeable difference after just one use, my skin felt softer and looked brighter! It's gentle enough for daily use but it still produces fantastic results. I like to use this with my favorite Kiwi Face Scrub so it packs an extra punch of exfoliation. One thing I don't like about this sponge is that it is hard to rinse the cleanser completely out of it so I spend a lot of time rinsing and squeezing it out, but I'm still left with some bubbles. It is recommended to change out this sponge every 3-6 months because the sponge will start breaking down on you. Now for the facial brush! To me this was basically like a Clarisonic brush head but just without the vibrating action, so I believed it would probably produce similar results. Spoiler alert, it's not. The bristles are very soft but densely packed so everything moves as one pack but molds well to the contours of your face so you're able to reach every inch of it. What I did like about this was that it was able to get to places I normally couldn't get a good scrub in such as around the nose area, actually the whole nose in general, they are just so oddly shaped! However I did not get such a sense of deep clean as I did with the sponge simply because I felt the bristles were so soft that it merely scratched the surface of things. Overall I like them both for different things but I think the konjac sponge is more what I'm looking for. I do use my Clarisonic in the shower. I checked the directions first because I also thought it was weird to use an electronic device in the shower, but it's completely waterproof and safe to use.